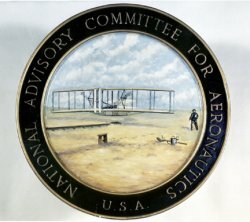 The National Advisory Committee for Aeronautics (NACA) was a United States civilian agency for aviation research, chartered in 1915 and operational from 1917 to 1958, when it was absorbed into the newly-formed NASA. NACA's mission was to "supervise and direct the scientific study of the problems of flight, with a view to their practical solutions." It concentrated mainly on laboratory studies at its Langley, Ames, and Lewis centers, gradually shifting from aerodynamic research to military rocketry as the Cold War brought an increasing priority to missile development. NACA built several wind tunnels that were used to support its research on airfoils and other aerodynamic components. It is particularly well known for its classification of airfoils and for its invention of a low-drag engine cowling. Major NACA contributions to the military missile programs came in 1955-57. Materials research led by Robert Gilruth at Langley confirmed ablation as a means of controlling the intense heat generated by warheads and other bodies reentering Earth's atmosphere; H. Julian Allen at Ames demonstrated the blunt-body shape as the most effective design for reentering bodies; and Alfred Eggers at Ames did significant work on the mechanics of ballistic reentry.